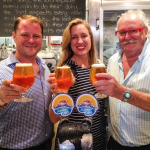 Carnival Cruise Line has toasted the success of Australia’s first custom-made cruise beer, ThirstyFrog Summer Ale. Launched three years ago, the specially created Ale – developed in partnership with The Lord Nelson Brewery – has proved one of the most popular beers on Carnival Spirit and Carnival Legend. Since launch, guests have enjoyed over 200,000 schooners of the Aussie-brewed Ale at sea. In celebration of the ongoing partnership and the 200,000 schooner milestone, Carnival’s Lance Dye, Business Development Manager, invited the team from the Lord Nelson Brewery Hotel onboard Carnival Spirit to enjoy the Ale in the much-loved, fun-filled, RedFrog Pub. “The Lord Nelson team were pleasantly surprised at how many taps were being used for ThirstyFrog Summer Ale and were pretty chuffed when told that Aussie and New Zealand guests have drunk 200,000 ales since we launched it just three years ago,” Dye said. 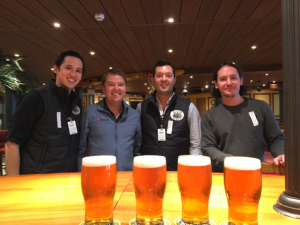 Lance was pictured on board Carnival Spirit ship-testing the ale at the source in the RedFrog Pub with Lord Nelson Brewery Hotel team members (left to right) Ciaran Gill, Kristian Savio and Andrew Robson.